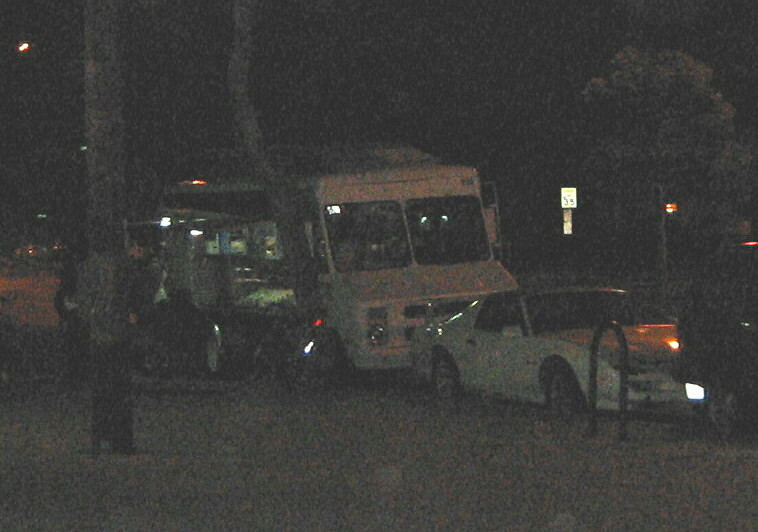 Tacos Chatos at one time parked in front of the public works building at Mclaughlin and Venice in Mar Vista. They've since moved to a new location in front of the strip mall that houses Howard's Bacon and Avocado burgers about a 1/4 mile east in Culver City. Their new setup has chairs and more lighting and an overall more relaxing feel. I ordered two tacos de cabeza and two tacos al pastor and popped open a lime jarritos. Cabeza is cow head, or to be more specific cow cheek. Most cabeza I have had has been too fatty and unappetizing. The cabeza at tacos chatos however was special. The soft velvety beef literally melted on my tongue. Some cabeza can be chewey with a strong beefy flavor that overwhelmes the taco but this was anything but . The flavor of the beef was subtle allowing the avocado salsa,and sala roja an equal part of the taco. Squirt some lime over the soft beef and dig in, you wont find better cabeza than this. For those taco eaters that havn't made the leap over to the more exotic meats and are interested in trying your first cabeza taco look no further than Tacos Chatos. If you are like me and your first cabeza taco was gamey and flabby and put you off ever ordering it again it's time to put it behind you and try these tacos . I still had some room left for the al pastor but even while biting into the pork tacos I still had the cabeza on my mind. The crumbled bits of pork didn't reach the heights of the beef but they weren't bad. The avocado salsa and roja and the soft fluffy tortillas made sure the taco would be an enjoyable one. so what are you waiting for? go to tacos chatos! 2. 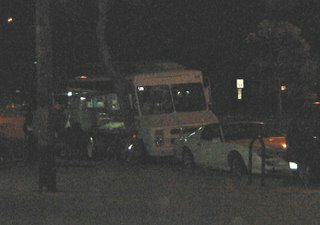 TC still parks in front of the DWP building at Venice and McLaughlin if its usual spot just east of Sepulveda is taken. I saw it there tonight. this is really close to my house (slightlyslack is right, it is in palms). i know what i'm having for dinner tonight. thanks for the tip! yum!! I know a truck that speicializes in cabeza tacos. Sorry, don't know the name, but it's on Sunset Blvd. between Echo Park and downtown, just about equi-distant between The Short Stop and Broadway, on the north side of the street. They've told me that cabeza is their best meat and, having tried everything they serve, I agree. A lot like you describe at TC - incredibly tender and moist, lean with a very delicate flavor. Absolutely melts in your mouth. The buche is good too. thanks for the corrections. I wasn't sure if it was Palms or Culver City and when I read the burger review of Howards that I linked it had the area penned as culver city. So I went with that. have you had cabeza before? I'm interested in your opinion of TC..either post here or email me. i'll try to track this truck down but echo park to downtown LA could be any number of trucks. I'm on the case tho amigo. I am going to drag sister moon & little bird there when I come to visit in august........thanks for the heads up. Senor Bandini why isnt Sesos an option on your taco filling poll? I'll be visiting my home state and am looking for the traditional "Old California" Style Tacos (FRIED corn tortillas, lettuce, meat, etc.) rather than the Mexican (carne asada, cilantro on steamed tortilla). Where can the best of that type be found in La La Land? Thanks. for "california" style tacos, i'd suggest Tito's at Washington and Sawtelle I believe. Get some beef tacos with cheese and pour some salsa on top and you'll be doing pretty well. 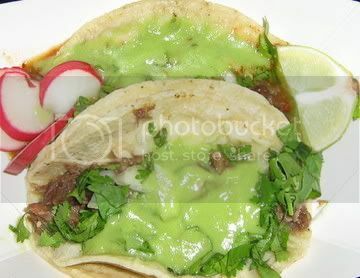 I like both traditional Mexican tacos as well as the more Americanized version. Chatos is good, but I was also given a serving of the english in response to spanish. The best response to this is to pretend to not know english; rather, you are a (insert non-US nationality here, I use Italian) on vacay. ARGH! Why can't I find this delish-sounding truck? TWICE I have driven by Howard's on a weekend seeking taco glory. Is it only around at night? Has it moved? Was it something I said? to quote billy corgan - they only come out at night, the days are much too bright. try after 8 on the weekdays and saturday. yo i tried to hit this place up the other week around dinner time on a weeknight and they wernt there.... just so you know. I went there last night (5/8/07) and another, impostor truck was there! Their cabezas were OK, but had large chunks of fat. Next time we'll check the DWP building if the squatters are at the usual location. They may have moved again. 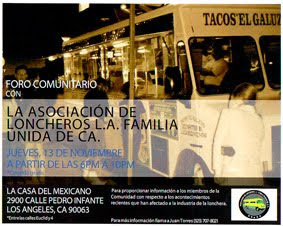 There is a truck at night (10pm-2am, every night but Sunday) that shows up at La Brea and Olympic. It is called El Chato and the truck is of a different style then the photo. 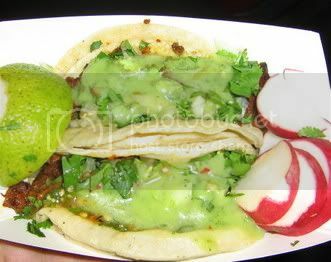 Best tacos in LA in my opinion, a must eat.